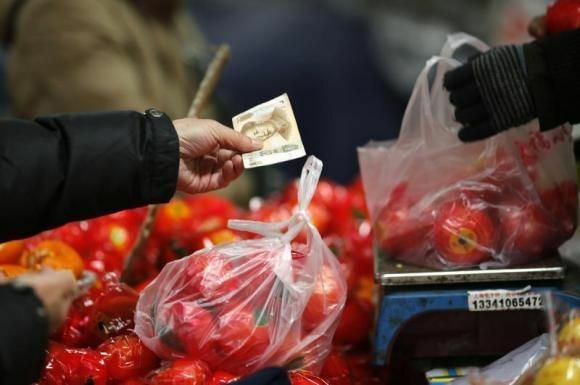 China’s inflation was muted more than expected during April and producer prices dropped for the 37th straight month, which added to concerns over growing deflationary pressure that likely will trigger further easing measures by the government. Annual consumer inflation rose 1.5% during April edging up from the 1.4% in March but well below the 1.6% predicted by most analysts. A jump seasonally in prices of food aside, some economists said figures pointed to moderate pressures from prices and lackluster demand domestically in the second largest economy in the world. Consumer prices were sluggish throughout April and there is still a lingering risk of deflation, said one analyst on Saturday in Hong Kong. Worried about the economy in China, whose growth has cooled to just 7% which is a low of six years, the China central bank cut interest rates while relaxing the reserve requirements at banks four times during the past six months. Indeed, the country’s central bank acknowledged its growth challenges Friday, when it announced that the economy was facing headwinds and the inflation outlook was benign, but ruled out a need for any quantitative easing. Wary of following in Japan’s footsteps, where a fall for a decade in consumer prices hurt the world’s third largest economy, officials in China warned about a danger of deflation by saying a cool down in the rate of inflation to less than 1% would raise new red flags. A recent poll last month showed that analysts expect the Chinese central bank to lower its interest rate 25 basis points during this quarter as well as lower its bank reserve requirement by at least 100 basis points during the remainder of 2015. A number of economists also said they expect additional support measures for China’s sluggish housing market. Data on Saturday showed higher prices for food drove inflation in April with prices of pork climbing 8.3%. Overall food inflation for the year was buoyant quickening in April to 2.7% in comparison to 0.9% for inflation that was non-food.